As a corporate partner, there are many benefits to working with the National Forest Foundation. Your support reaps tangible conservation results for our nation’s forests, watersheds, wildlife, and recreation resources. The NFF’s corporate partners connect with thousands of outdoors enthusiasts, conservationists and our own Friends of the Forest. They also creatively engage employees and customers in helping support and care for our forests. Most importantly, in partnership with the NFF, companies can demonstrate their commitment to perpetuating our uniquely American legacy of public lands. The NFF is a 501(c)(3) nonprofit conservation organization, making your support tax-deductible. The NFF recognizes our corporate partners in many ways, including through our web-site, various publications, e-newsletters and special events. We work with corporate partners to design custom cause-related marketing, sponsorship, strategic restoration and other partnerships that restore our National Forests and provide businesses with high quality outreach opportunities. Through our campaign to plant 50 million trees, we're working with leading corporations and businesses to address the immense reforestation need facing our forests. Click here to learn more. Our signature Ski Conservation Fund (SCF) and Forest Stewardship Fund (FSF) programs provide funding for action-oriented on-the-ground restoration projects that improve forest health and outdoor experiences on National Forests and Grasslands. Funds come from guest contributions at ski areas and lodges operating on or adjacent to National Forest System lands, and we add additional funding for the SCF program to increase our impact and get more done on the ground. With properties and operations from the Western Slope to the Front Range, the identity of Vail Resorts is intertwined with Colorado and its natural heritage. Vail Resorts is a leading member of the NFF's Ski Conservation Fund and was the lead private partner in the Hayman Restoration Partnership. Vail is also supporting lynx habitat improvement projects on the White River National Forest as well. The core purpose of REI, the nation's largest consumer cooperative, is to inspire, educate and outfit for a lifetime of outdoor adventure and stewardship. A longtime partner of the NFF, REI generously donated $1 million to the NFF in 2017 and 2018 for trail, campground and forest restoration projects and to get youth out onto our National Forests. This recent work builds on our long-time partnership which has focused on the San Gabriel Mountains National Monument and post-fire restoration efforts at sites impacted by 2015 wildfires. Brewed for the outdoors, Busch Beer is a premium beer made for those that enjoy the outdoors. Through our partnership with Busch, we’re teaming up to raise awareness of our National Forests and support the important tree planting efforts that help restore our forests. By engaging customers and more, we’re going to plant more than 150,000 trees. Originally from the Patagonia region in South America, we’ve decided to start our next adventure in the U.S. Through our “Buy a Case, Plant a Tree” program, Cerveza Patagonia has committed to supporting National Forests by planting at least 200,000 trees by 2020. We’re excited to help restore and preserve our forests so our consumers can always stay connected to nature. As part of their commitment to become water neutral by 2020, Coca-Cola began partnering with the NFF in 2012 to sponsor watershed restoration projects that return water back to nature. Through mountain meadow restoration, stream channel improvements and invasive species removal, Coca-Cola has replenished more than 1 billion liters of water back to nature. Caudalie is a private cosmetics company based in Paris with boutique stores in the United States and worldwide. With a deep commitment to green principles and sustainable practices, Caudalie’s initial investment in National Forests resulted in the planting of one million trees between 2015 and 2018. They have now committed to planting an additional million trees by 2021. Co-founder Mathilde Thomas notes that “This partnership demonstrates Caudalie’s commitment to giving back to the Earth a little of what it gives us every day. We are thrilled to be working with the NFF to restore America’s National Forests." Boxed Water is a leading reforestation partner thought the NFF’s Trees for US program. Boxed Water inspires a better tomorrow by rethinking packaged water today. Boxed Water is committed to helping the environment by pledging to plant 1 million trees with the NFF by the year 2020. Intel knows the value of water. That's why they're working with the NFF to restore National Forest watersheds in Arizona and New Mexico. These projects are providing a measurable benefit to natural systems by restoring wetlands, wet meadows and stream channels. These efforts improve the natural hydrology and increase natural storage of water, which benefits natural and human communities. As part of its long-term rebuilding efforts in California, The Starbucks Foundation dedicated $50,000 to the California Wildfire Reforestation Fund to help plant 50,000 trees on California forests in recognition of the impact the fires have had on Starbucks partners (employees) in California and their communities. This commitment was part of a broader $200,000 contribution to the NFF to plant 200,000 trees nationwide, at least one tree for every Starbucks partner in the U.S.
MinuteKEY developed the first ever self-service key duplication kiosk. They are dedicated to sustaining our environment and limiting waste. True to their Colorado roots, minuteKEY is committed to protecting the environment by doing its part to reduce waste. By working across multiple fronts, its organization is moving towards a more sustainable future. Through not packaging keys, using digital receipts, minuteKEY has saved on plastic and paper. In 2015, minuteKEY partnered with the National Forest Foundation in an effort to defend and sustain our forests. One of the largest utility companies in the U.S., Edison International supports the NFF's Treasured Landscapes campaign through their support of our efforts on the Angeles National Forests and San Gabriel Mountains National Monument. Additional support benefits other Southern California National Forests. Through their Trees for Change program, Salt River Project has teamed with the NFF to replant burned areas in Northern Arizona. To date, SRP has planted more than 800,000 trees on National Forests that have been affected by wildfire. Additionally, SRP is a leading partner and supporter of the Northern Arizona Forest Fund, which is restoring critical watersheds and reducing the risk of severe fire on National Forests in Northern Arizona. Southwest Airlines Co. is one of the major U.S. airlines and is the world’s largest low-cost carrier. As part of its commitment to conservation, Southwest partners with the NFF to enhance the health and promote the public enjoyment of America’s National Forests. 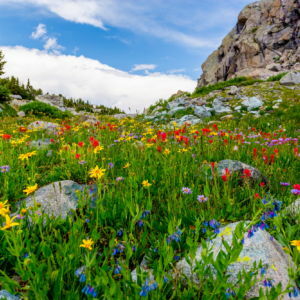 Thanks to Southwest Airlines Co. and the Southwest Airlines Foundation’s generous support, we are able to expand the public’s outdoor experiences on these public lands and connect more Americans to their backyard National Forests. Lands’ End, a high-quality American clothing retailer, began their partnership with the NFF in 2012. As one of the NFFs leading reforestation partners, Lands’ End has planted one million trees on National Forests in need of reforestation in the Great Lakes area and California. Freeport-McMoRan, a leading international mining company, involves communities and partners in its policies, programs and initiatives. To bolster this collaboration with communities, Freeport-McMoRan has supported NFF efforts, including restoration of the Eagle River headwaters at Camp Hale, the Northern Arizona Forest Fund, Find Your Fourteener campaign, and Gunnison Stewardship Fund. Polaris is a recognized leader in the powersports industry. As an organization whose products are often used on public lands, Polaris works with the National Forest Foundation to give back to our National Forests through trail restoration projects, reforestation and charitable product donations. As a One Percent for the Planet recipient, the NFF works with One Percent's partners to deliver custom, creative partnerships that produce measurable results while highlighting the partner's commitment to the environment. We are proud to work with Caudalie and Boxed Water through this partnership. On Air Parking, the popular parking deal website, encourages travelers to think ahead about their parking through their ridiculously low city, airport and cruise parking rates. Making it simple and easy for travelers to get where they want to go, On Air Parking is committed to becoming the first carbon negative company in the parking and transportation industry through their Park Once, Plant a Tree initiative. Blooms Today is a national floral provider that is not just a flower business, but a provider of sentimental expression. Our customers can choose to plant trees in honor of friends and loved ones for all occasions and life events. With the NFF, the life-long value of planting trees sends expressions of love, gratitude, condolence or devotion while also joining in the national restoration effort.